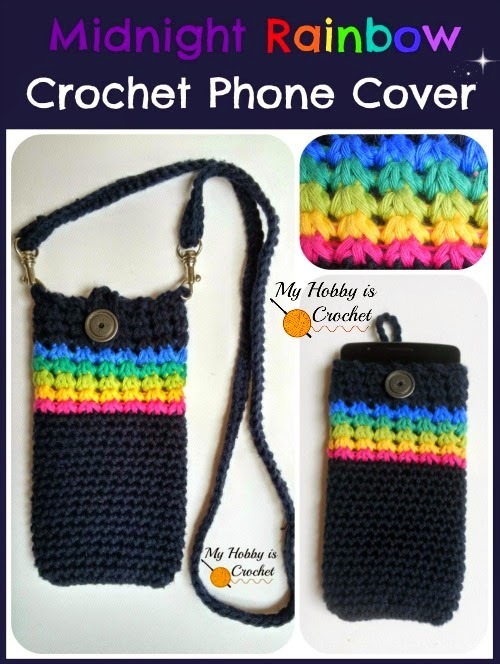 This crochet cell phone cover with detachable strap is not only pretty, but also very practical! Use it without strap to protect your cell phone worn in the bag or attach the strap and hang it around your neck, for example, to have your hands free at the playground or hearing music while driving a bike, etc. 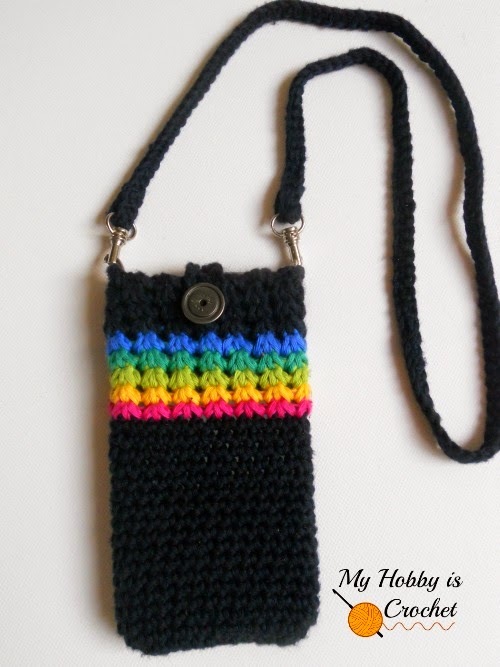 The "Midnight Rainbow" Phone Cover pattern is very easy to customize to the desired size, the only thing to keep in mind is that the foundation chain should be a multiple of 2 (even number)! The cover I made is 15 cm long and 16 cm in circumference. 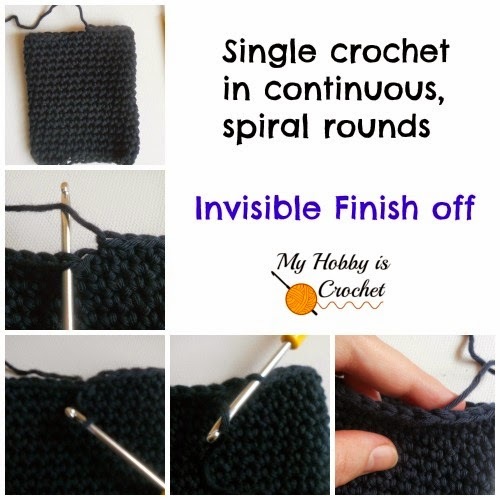 Starting at the bottom, work the main body part with single crochet in continuous, spiral rounds. The upper side will be worked using the Trinity Stitch in the round, changing colors after each round in a way that will give you a perfect joining, without visible seams. sc3tog = sc cluster= Insert hook into the indicated stitch, wrap yarn around hook, draw a loop through, ( insert hook into next st, wrap yarn around hook, draw a loop through) x twice; you have 4 loops on hook, wrap yarn and draw through all 4 loops on hook. 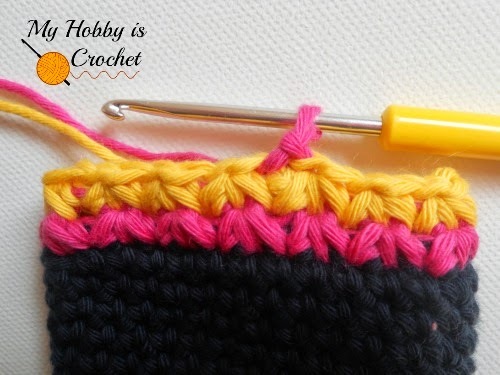 tw sc= Twisted Single Crochet; see the Stitch instructions with tutorial HERE! Do not sl st to join, continue working in spiral rounds sc into each sc around until your piece measures less then 2/3 of your phone length. I made 17 rounds. To even out the edge, at the end of the last sc round, slip stitch to join, but work the sc stitches until a few stitches before the normal joining point and fasten off invisibly, as in the picture below. 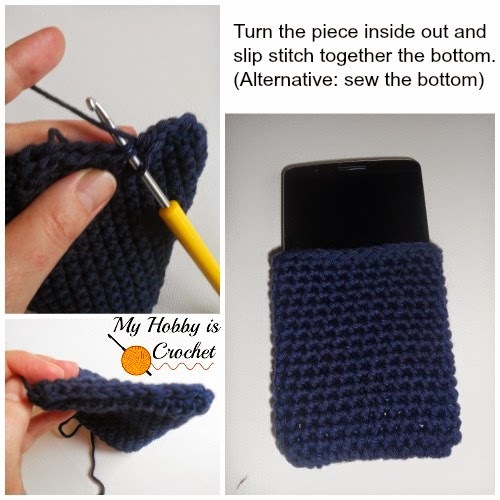 Turn the piece inside out and sew/ slip stitch together the 2 bottom sides with the long yarn tail left unworked at the beginning of your project. Turn again the piece on the right side. Each Trinity stitch in the round will need 2 sc, so in my case, for 28 sc made, I have 14 clusters each round. Round 1: First stitch: Wrap yarn color B around hook once, insert hook into top of the sc in the middle of the back side, pull yarn through st; you have 2 loops on hook; (insert hook into next st to the left, pull loop through) x 2 times; you have 4 loops on hook, wrap yarn around hook and pull through all 4 loops on hook. Next stitches: *ch1, sc3tog inserting the hook first into same st as the 3rd leg of previous cluster, then into each of next 2sc *, repeat around from * to * until you have 1 sc left between the first and the last cluster made (picture 8 in the collage below). Ch1, work the last sc3tog inserting hook into same st as the 3rd leg of previous cluster, then into the next sc st of previous round, then insert the hook into first st of previous round, same as for first leg of the first cluster. In the next step change color: wrap yarn color C around hook and pull it through loop color B on hook; continue with C; ch1 and sl st to top of first st. 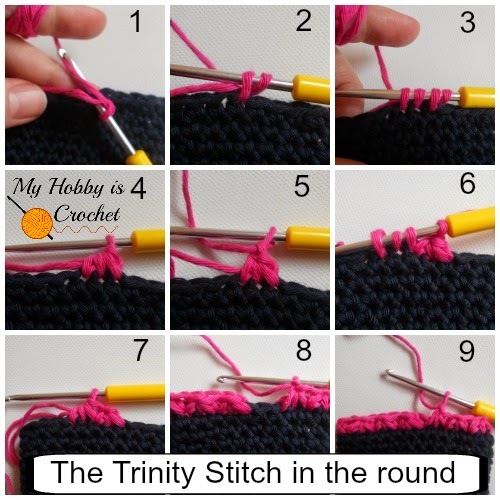 Here is an example for the first round of the Trinity stitch without changing colors at the end of the round! If you will change colors, work the same steps till picture 8, then after you finish the last trinity st of the round, the ch1 in picture 9 will be made with new color, as written above. Continue with C, ch1, sc3tog inserting the hook first into first st (top of first cluster), then into next ch1 sp, then into top of next cluster, *ch1, sc3tog inserting the hook first into same st as the 3rd leg of previous cluster, then into next ch1 sp, then into top of next cluster *, repeat around from * to *; the last cluster will be made like this: sc3tog inserting hook into same st as the 3rd leg of previous cluster, then into the next ch1 sp, then insert the hook into same st as for first leg of the first cluster. Before the last ch1 and join into round, change color!! : wrap yarn color D around hook and pull it though loop color C on hook; continue with D; ch1 and sl st to top of first st. Note: Don't be confused! Even if the ch 1 sp seems to be the top of cluster, the top of the cluster is always on the right side of the cluster! Be sure to always have 4 loops on hook before finishing a cluster. Don't forget to ch 1, after you finish each cluster! The trinity clusters should be aligned like in the picture below. You can see that the seams are quite nice! Never mind the pink color change for the 3rd round. It was my previous thought how to use the colors! Rounds 3- 8 repeat as round 3 changing colors each round, as you wish. I have made 5 rounds changing colors after each round, then worked the last 3 rounds in the main dark color. Button Loop: ch 14 (or as many to fit over the phone and your button), sl st into same st. Cut yarn and fasten off. Sew on the button to the front. Strap: Chain 140 (or as many chains to reach the length you wish), turn and work sc into back bump of each chain across starting with the 2nd chain from hook. Cut yarn leaving a long tail. 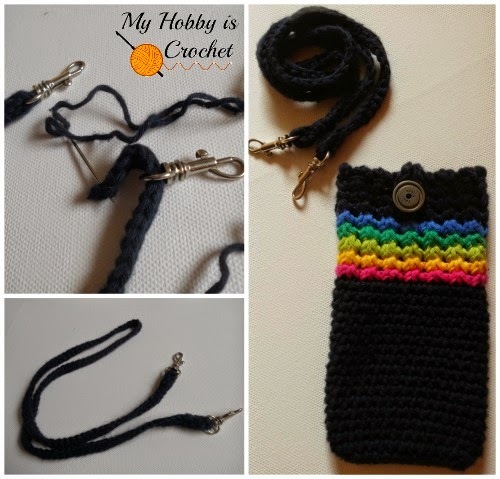 Insert trigger hook clip on strap end, fold and join end of strap together using tapestry needle. Repeat for the other strap end. 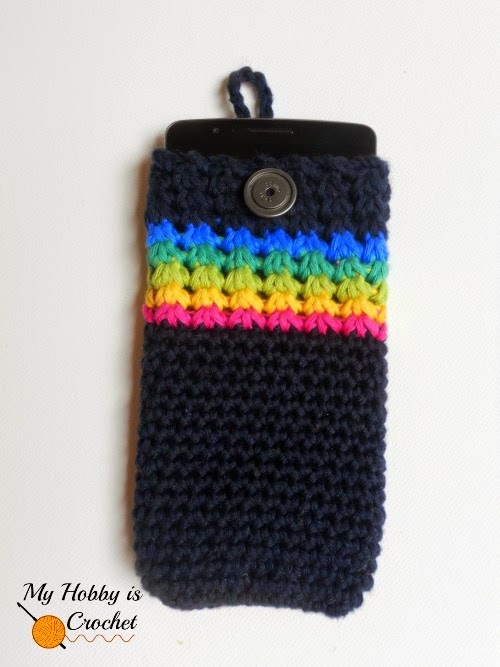 Attach the strap to the phone cover, inserting the hook clips into ch spaces of the twisted sc edging. 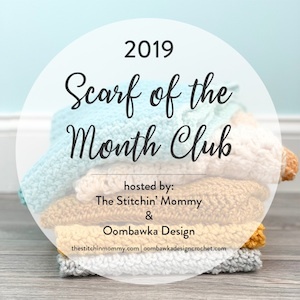 I hope you have enjoyed this pattern and tutorial!